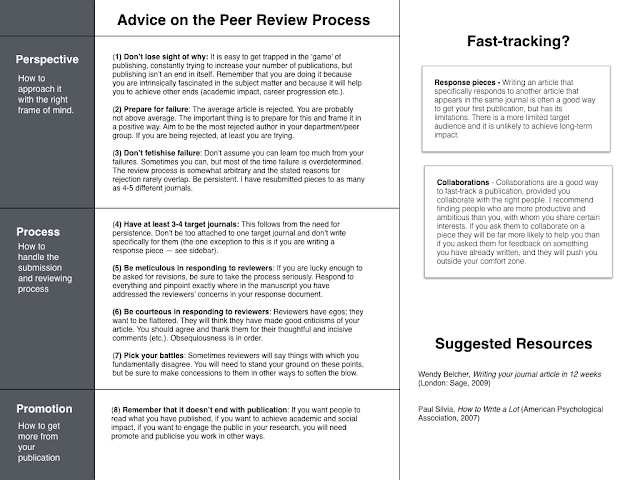 I was recently asked to give a short, ten minute presentation on writing and publishing peer review articles. The presentation was aimed at PhD students. In preparing for the talk, I realised how difficult it is to distill my thoughts on the process into just ten minutes. I have a love-hate relationship with publishing for peer review. It is essential to my life as an academic, but I sometimes feel trapped by the publication ‘game’, and I often feel that the benefits are often minimal and ephemeral. I could probably talk for several hours about these feelings without getting to any practical advice. Anyway, since I didn’t have several hours, I decided I would focus my talk on eight key ‘tips’, divided broadly into three main categories (perspective, process, and promotion). None of these tips deals with how to actually write an article (I have dealt with that topic on a previous occasion). Instead, they focus on the attitude toward the process and how to respond to reviewer’s comments. I thought it might be worth sharing them here. (1) Don’t lose sight of ‘why’: This is the most important thing. As a budding academic, it is very easy to get trapped in the ‘game’ of publication. As you begin to succeed in publishing you become acutely aware of your total number of publications. Very few academics can keep track of the substance of what their colleagues write, but they can all keep track of the number of pieces they publish. And so your number becomes the currency of self-worth. Try to avoid thinking in this way. If you become obsessed with your number, you will never be happy. I speak from experience. I once set myself the target of publishing 20 peer reviewed articles, thinking that if I reached that target I would have ‘arrived’ as an academic. But once I reached the 20-article target, I realised that the 30-article target wasn’t too far away. I needed to knuckle down and reach that too. I just as soon realised how silly I was being. I had lost sight of why I was publishing in the first place. Publishing is not an end in itself. There are reasons for doing it. The most important of those reasons — and the ones that sustain you in the long-run — are the intrinsic joys/pleasures you experience in researching, thinking and writing about a topic that interests you. The other reasons are more instrumental in nature. They are quite important too, but for more practical reasons. After all, publication is a gateway to achieving academic impact, social impact, public engagement and career advancement. (3) Don’t fetishise failure: Don’t assume that you can learn too much from your failures. Sometimes you can, but most of the time you can’t. Academic failure is overdetermined. What I mean by this, is that there are probably many factors that prevented your article from being accepted for publication, no one of which was necessarily fatal or would be fatal if you were to resubmit the article elsewhere. Editors and reviewers are looking for reasons to reject your paper. Their default is ‘reject’. They have to set this default to maintain the prestige of their journal [thanks to Ashley Piggins for emphasising this point to me]. The reasons for rejection provided by reviewers often do not overlap. If you addressed every objection they raised before sending your article on to another journal, you would probably end up with an incoherent article. If you are rejected by a journal, look over the reviewer reports (if any), see if there are any consistent criticisms or comments that strike you as being particularly astute, revise the article in light of those comments, and then send it off to another journal. If there are no such comments, just send it off to another journal without substantive revisions. Persistence is the name of the game. I am now willing to resubmit the same piece to several journals (sometimes as many as 4 or 5) before giving up on it. (4) Have at least 3-4 target journals: This really follows from my previous bit of advice (“Don’t fetishise failure”). I always start writing articles by having at least 3-4 target journals in mind. I don’t think you should be too wedded to one target journal. You should aim for something of reasonably high quality, but don’t predicate your well-being on having your article accepted by the top journal in your field. That’s something that will come with time and persistence. I also don’t think it is worth revising your article for your target journal’s ‘house style’. I have never had an article desk-rejected because I failed to format it in house style. As long as the article is a good fit for your target journal and you have written and referenced it well, it stands a chance. You can worry about house style after you have been accepted. (5) Be meticulous in responding to reviewers’ comments: If you are lucky enough to be asked for revisions, be sure to take the process seriously. You should always prepare a separate ‘response to reviewers’ document as well as a revised manuscript. In this document, you should respond to everything the reviewer has highlighted and pinpoint exactly where in the revised draft you have addressed what they have said. Speaking as someone who has reviewed many manuscripts, I feel pretty confident in saying that reviewers are lazy. They don’t want to have to read your article again. They only want to read that parts that are relevant to the comments they made and check to see whether you have taken them seriously. This is all I ever do when I read a revised manuscript. (6) Be courteous in responding to reviewers’ comments: Remember that reviewers have egos; they want to be flattered. They will have taken time out of their busy schedules to read you article. They will have raised what they take to be important criticisms or concerns about your article. You should always thank them for their ‘thoughtful’, ‘insightful’, and ‘penetrating’ comments. This is one area of life where you cannot be too obsequious. (7) Pick your battles: Sometimes reviewers will say things with which you fundamentally disagree. You don’t have to bow down and accept everything they say. You should stand your ground when you think it is appropriate to do so. But when doing this be sure to acknowledge that the reviewer is raising a reasonable point (and always consider the possibility that the fault lies in how you originally worded or phrased what you wrote) and be sure to make concessions to them in other ways. To give a somewhat trivial example, I feel pretty strongly that academic articles shouldn’t be dry and devoid of ‘colour’. One of the ways in which I try to provide colour is by using well-known cultural or fictional stories to illustrate the key points I am making. This is one of the principles on which I stand firm. I once had a reviewer who wanted me to take a cultural reference out of an article because it was unnecessary to the point I was making. I stood my ground in my response, explaining at some length why I felt the example was stylistically valuable, even if logically unnecessary, and further discussing the importance of lively academic style. At the same time, I accepted pretty much everything else they reviewer had to say. Fortunately, they were gracious in their response, saying that they enjoyed my ‘spirited’ defence of the example, and accepting the article for publication. (It was this article, in case you were wondering). (8) Remember that it doesn’t end with publication: If you care about your research and writing, you won’t want it to languish unread in a pay-walled academic journal. You will want to promote it and share it with others. There are a variety of ways to do this, and discussing them all would probably warrant an entire thesis in and of itself. I personally use a combination of strategies: sharing open access penultimate versions of the text on various academic repositories; blogging; social media; podcasting; and interviews with journalists. I have never issued a ‘press release’ for anything I have written. I find I get enough attention from journalists anyway, but I think there probably is value in doing so and I may experiment with this in the future. Bonus: Can you fast-track publications? Write a response piece: i.e. write an article for a particular journal that responds, in detail, to another article that recently appeared in the same journal. This was how I got my first couple of acceptances and I think it can be very effective. In reality, of course, every academic article is a ‘response’ piece (they all respond to some aspect of the literature), it’s just that most are not explicitly labeled as such. What I am calling a ‘response piece’ is an article that is noteworthy for its academic narrowness (it only responds to one particular article) and journal specificity (it is really only appropriate for one journal). Both of those features limit its overall value. It is likely to have a more limited audience and is unlikely to achieve long-term impact. But it can provide invaluable experience of the peer review process. Collaborate: In some disciplines collaboration is common; in others it is rare. I come from one of the latter disciplines. Nearly everything I have published has been solo-authored, but I have recently started to collaborate with others and I am beginning to appreciate its virtues. I think collaboration can work to accelerate the writing and publishing process, provided you collaborate with the right people. Some people are really frustrating to collaborate with (I’m pretty sure I am one of those people); some people are a delight. Obviously, you should pick a collaborator who shares some relevant research interest with you. On top of that, I recommend finding someone who is more productive and more ambitious than you are: they are likely to write fast and will push you outside your comfort zone. Furthermore, collaborating with them is far more likely to elicit engagement than simply asking them to provide feedback on something you have written. That said, I don’t think you should aim too high with your potential collaborators, at least when you are starting out. Pick people you know and who are broadly within your peer group. Don’t aim for the most renowned professor in your field, unless they happen to be your supervisor or a close friend. Again, you can build up to that. Okay, so those are all my tips. To reiterate what I said at the outset, these tips only address part of the process. They don’t engage with the substance of your article and that really is the most important thing. Still, I hope some of you find them useful. The handout below summarises everything discussed above.